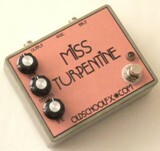 The Miss Turpentine delay offers up to 550ms of delay. It creates a very warm, lush analog delay sound. Use it to create a haunting empty room reverb sound, a classic slap back echo, endless half second repeats, or anything in between. Because of the power consumption, The Miss Turpentine can only be run off of the 9v power jack and does not have a battery option due to the limited space in the enclosure. Level - Adjust to control your desired volume of delay repeats. Repeats - Adjust to control the amount of delay repeats. Time - Adjust to control the amount of time between your repeats.